Not long ago, Kate and Nick, my wonderful blog mistress and master, without whom my blog would not be possible, visited on their way north. 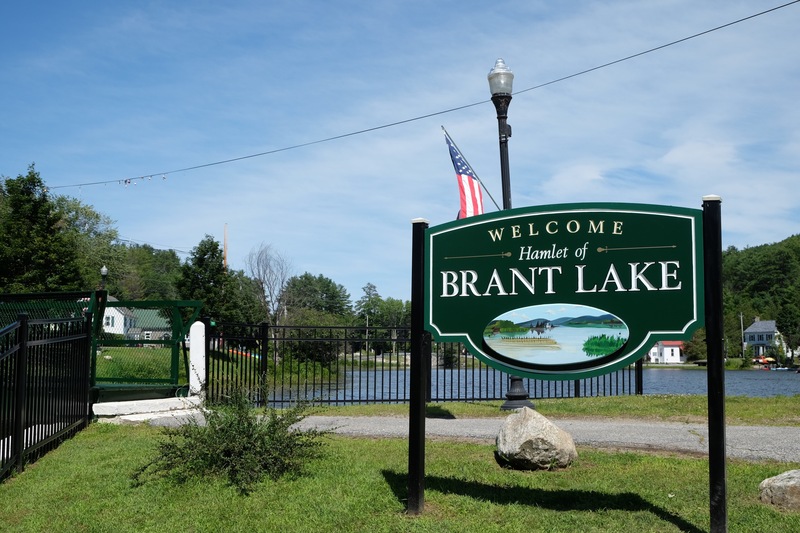 The couple had never seen Brant Lake, but after more than 100 postings they were experts on the area. Now I could share the reality that endears me to Brant Lake. So we went for a tour. The first place of interest was the meadow where Elgar, the giant black Freesian horse, and his partner, the diminutive pony Pokémon, often grazed. The tall grass on which the horse and pony dined had recently been mowed and Elgar and Pokey were nowhere to be seen. Normally, I would simply pass by the meadow but on this day I told Kate and Nick of the time when I had watched a rafter of wild turkeys strutting across the field in single file and, quite by accident, I came across a mother turkey sitting on her eggs in a nest under a bramble bush. On another morning two very young coffee-colored fawns with white polka dots covering their bodies frolicked near the border where meadow fades into forest. Alerted by the doe that a stranger was in the area, they quickly scampered away, seeking cover in a grove of beech trees. As I shared my experiences in this seemingly barren meadow, the scene came to life and what I usually took for granted was momentarily viewed in all the splendid colors of a farm at Brant Lake. Our next destination was a quick drive through the senior camp at Brant Lake Camp for Boys. Only one or two campers, wearing the traditional green shorts, were playing outside on this gloomy day but, as we passed Bunk H, I saw one child with light brown hair carrying a gray backpack as he left the bunk. From the distance he might have been me when, as a 12-year-old, I lugged my duffel bag into Bunk H to begin what would be a lifelong infatuation with the camp and the lake. I wondered if the initials DW that I had surreptitiously carved into the pine wall behind my bed had been erased by time. At the head of the lake we crossed the bridge where the lake narrows into the Spuyten Duyvil. In earlier years I canoed that stretch, gliding through lily pads whose golden blossoms opened to greet me. I can still feel the weight of lifting my canoe over a beaver dam that spanned the stream. Our tour complete, Nick and Kate thanked me but I was the one to express gratitude. Memory had been awakened, and, as I traveled through history, I experienced the Brant Lake I knew so well, except now it was reframed by my imagination and imbued with new insight as seen from the perspective of my guests. Thank you, Kate and Nick.